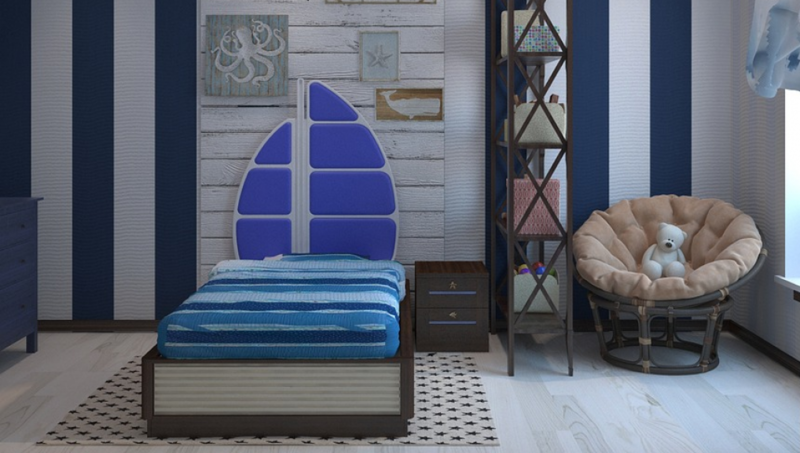 A child’s room should be designed with comfort, function and safety in mind. Above all, however, a child with autism needs a room that allows them to have their own space. Higher levels of anxiety can be fairly common in children with autism, as opposed to their peers who are not on the spectrum. That’s why it helps to have spaces where they can relax and feel at ease. You can create calm and comfort in your child’s room by using curtains as partitions between play areas, study zones and areas to relax. If your child shares a room with siblings, curtains can also help you divide the room without any major renovations. Children who are on the spectrum can benefit from choice, among other independence-building skills. That can include helping make choices for how to set up their bedroom. If your kids have a hard time making decisions, start with small ones, like what cartoon characters to include or what colors they think would work. Just make sure their choices, and yours, will help create a bedroom that’s calming and conducive to relaxation and sleep. Many people with autism are adversely affected by the flickering of fluorescent light bulbs, so it may be best to keep those out of your child’s living spaces. You can also use curtains, rugs and soft items to help absorb noises and provide quiet in your child’s room. Finally, create an environment that will make it easy to keep things tidy. Children on the spectrum can be overwhelmed by clutter, so keeping things organized helps. Aside from flickering lights, people on the spectrum can also be tremendously impacted by color. Some children can even feel ill or have severe reactions when presented with loud splashes of color or intense hues. Soft shades of blue, brown and grey are practical choices for the walls and decor in your child’s room. If you need to paint the walls, try to do so when there is no furniture inside, or cover everything securely before you start. It’s also a good idea to shop around for no-VOC and non-toxic paint options. Many common interior points release toxins into the air inside your home, which can make it more difficult for your children, and your entire family, to breathe safely. It may seem like a good idea to include a television or computer in your child’s bedroom, but studies show that adding a TV can cause issues with learning, lead to health issues and even cause aggression. Try to limit which electronics are allowed inside your child’s room. Kids who are on the spectrum can benefit from time spent playing on apps on tablets (Lenovo offers lots of budget-friendly options). Spending time using tablets can enhance your child’s language skills, but be sure those screens are switched off a few hours before bedtime. If you want to add some toys or electronics to your child’s space for playtime and learning, try to stick to options that will help them explore their senses. Use this list of autism-friendly toys to stock their play spaces. Setting up a relaxing space at home for your kids is important, especially when your child is on the spectrum. By keeping your child’s abilities and sensitivities in mind when you create this area, your child will have a room where they can really unwind and feel like themselves.